Chatbot - At a glance !! Chatbot is basically a software, which simulates conversation with humans over internet via auditory or textual interfaces. Nowadays, the appeal of chatbot across numerous industries is almost impossible to be denied. Chatbots have become the boon and with usage of Chatbots, smart industries are saving their resources and money by interacting with the customers. 85% of customer relationships to be automated by 2020. (By Gartner Customer 360 Summit). If you are the owner of an on demand insurance aggregator platform, you already are aware about the importance of bringing innovations to your business products to stay in the competition. 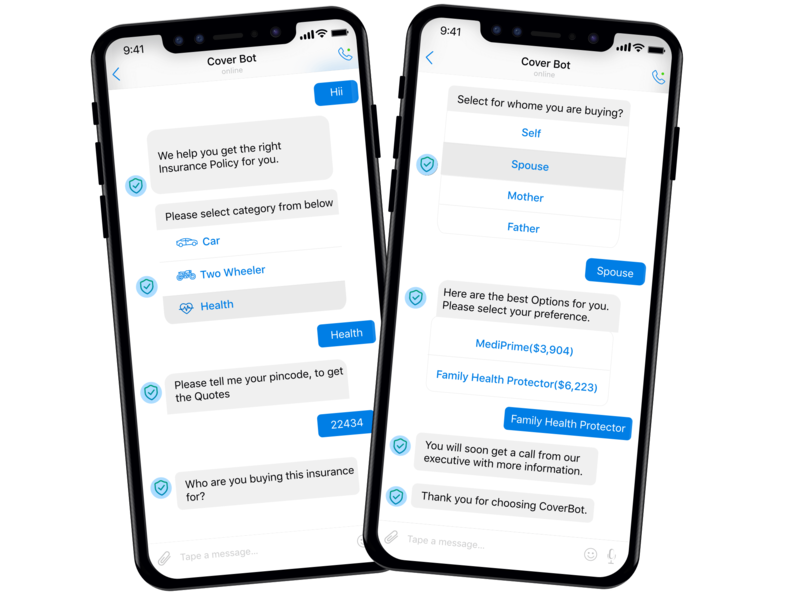 Chat bot is destined to enhance customer experience that will help in providing better customer service for your insurance aggregator platform. The estimated cost of developing Chatbot for insurance aggregator platform will be in the region of $3.5k-5k. Let us have a look at the features users will be able to avail through Chatbot development in the application. Chatbot - The future saviour in Insurance industry!! In recent times, almost all businesses – small and large are stepping into AI Chatbot Development from conventional Mobile App Development. Apparently, Chatbot creation will be the major part of any businesses till 2021 and 2018 is the starting point of the revolution. According to a recent study, 7% of insurers in Germany are already using chatbots to supplement their range of services; another 44% are planning such a step. In accordance with Global Trends Study 2017, insurance invests around $124 million per company on an average in this powerful technology. That’s $54 million more than the average across all industries surveyed. Global insurance giant QBE, invested in HyperScience,a machine learning company earlier this year. Magda is the chatbot for Link4, an online car insurance company based in Poland. Allie is Allianz’s virtual online assistant that offers policyholders a 24/7 service. Allstate launched its virtual assistant ABIe (Allstate Business Insurance Expert) in 2015 to more efficiently answer questions from its 12,000 agents. Arbie supports the customers of RBC Insurance in Canada with all possible questions. Marc represents the health insurance offer of the French Credit Agricole. With the expertise of in-house Chatbot developers, Blockchain and AI developers, Web developers and designers; we have provided IoT and AI based solutions to the wide range of industries. Our Artificial intelligence, and the associated technologies of Natural Language Processing (NLP) and Machine Learning (ML), enables retailers to reach out to customers at a personal level, engage in deeper interactions and enhance their experience with the brand.experience with the brand. 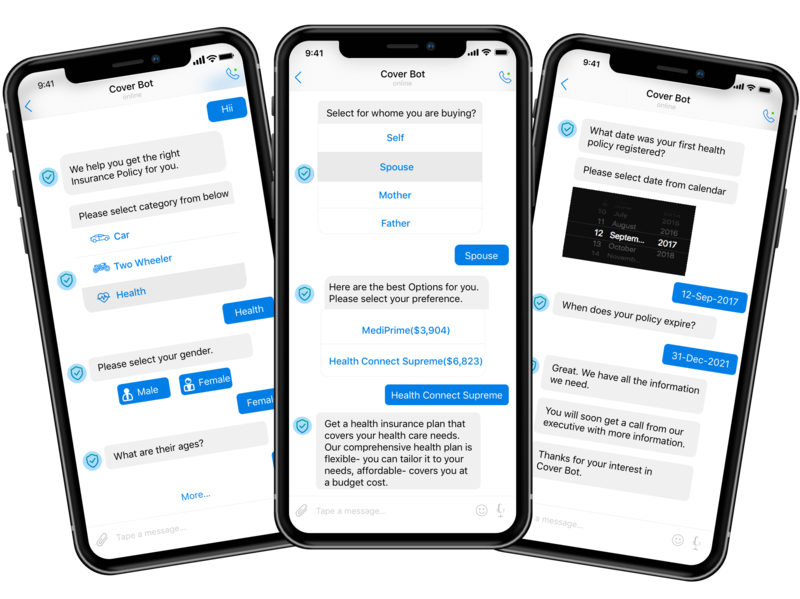 Are you looking for an exclusive chatbot development team and wish to add value to your insurance aggregator platform with a Chatbot interface to enhance UX? Can I integrate Chatbot developed by you with my existing Insurance aggregator platform? It is not mandatory to host the Chatbot on a separate server. We can develop and integrate the Chatbot to the same server that runs web or mobile app for an Insurance aggregator platform. Which type of Chatbot should be integrated with Insurance aggregator web/ mobile app platform? 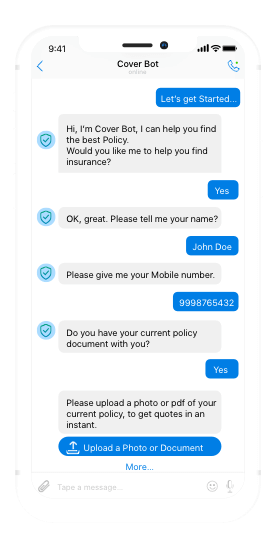 Converational and flow based Chatbots can be built and integrated with Insurance aggregator platform. Can you provide option to hire dedicated Chatbot developers for my Insurance aggregator platform? Have an !dea or need help with chatbot solution for an insurance aggregator platforms?